As the election grows near, our quadrennial angst over political-religious overlap again grows palpable. This week featured news of the Billy Graham Evangelical Association removing Mormons from their list of cults, which closely followed a highly publicized meeting between Republican Presidential candidate Mitt Romney, a Mormon, and the 93-year-old Reverend Graham. In a word ... ugh. Don't get me wrong. I take no issue with Mr. Romney's religion as a political matter. I'm of the opinion that electing a politician (or choosing a dentist, for that matter) is different from calling a pastor. 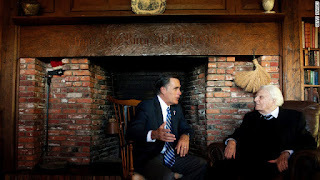 I don't worry that Mitt Romney has a secret, insidious plan to Mormonize the country. He may very well make a fine president. No, my disgust is reserved for what appears to have been a politically influenced calculation by a major evangelical group to change its stance on a doctrinal matter. Short version: less than a month before the election, a Mormon candidate visits the nation's most prominent evangelical minister. The following week, the minister's public stance on Mormonism appears to soften. Ostensibly this is all because the BGEA didn't want to "participate in a theological debate about something that has become politicized during this campaign." Well, how did that work out for you? If you didn't want to open a can of worms, the recommended strategy would have been to avoid (a) having a press event with a major-party candidate, then (b) appearing to make major changes in public, theological positions related to said candidate three weeks prior to election day. A year ago I wrote in these pages about the potential for a major-party Mormon candidate, and wondered at its effects on the evangelical community. As I said at the time, "The fact that orthodox Christians consider Mormonism to be a non-Christian religion is hardly breaking news. Mormons reject the trinity and embrace a form of polytheism known as henotheism, which is to say they claim to worship one God while accepting that others exist. They believe that the God they worship was once a man, and that Satan and Jesus were both his children (and were therefore brothers)." So no, we should not make the mistake of saying Mormons are just another Christian denomination with a few minor doctrinal differences. We diverge fundamentally on the core issues of the person of Christ, the character of God, the way of salvation, and the text of Scripture. I further noted last year that every four years, "Americans are left to wonder how it came to the point where our politicians are being asked by reporters to weigh in on theology. Well, because somewhere along the line we decided that pastors should be endorsing political candidates." Christians can and should vote, support candidates, run for office, etc. as they are so inspired. But the church needs to keep in mind that our primary calling is to know and preach and exalt Christ. Satan is more than happy to lead us into worldly preoccupations, through politics or otherwise. As an aside, The Gospel Coalition has an interesting panel discussion on the topic of preachers and politics. When you have 15 minutes, listen to the whole thing. Is the Pulpit Political? from The Gospel Coalition on Vimeo. In the 1880's the Congress of the United States seized Mormon property and forced them to abandon polygamy. Ed Decker in his 1984 book "The god Makers" says that the Mormon church has had a long standing belief that they will save the Constitution and the United States. I don't know what Romany might do to help his religion as President, but I do think they will be more accepted by people and there will be more people who will become Mormons because the President of the United States is a Mormon. As for me, I wont be voting for the lesser of the two evils. You have good insights here. Thank you for sharing.